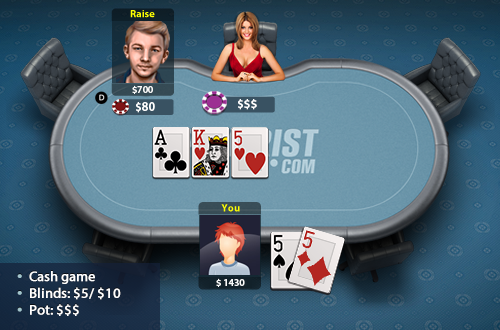 You’re playing a $5/$10 heads up cash game with $1,500, your opponent has $850. You have been running them over the first 20−25 hands of the match, they are very tight pre-flop. You raise to $25 from the button, and get 3 bet to $70. You have 55 and just call. The flop is AK5 two hearts. They bet $80.